On Tuesday 25th June 2019 we have the pleasure of a Golfing Legend. 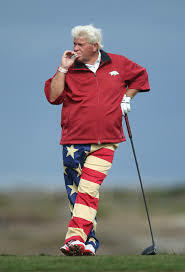 1991 US PGA Champion & 1995 Open Champion John Daly will be coming to Greenway Hall to deliver and exhibition of his Golfing Skills, after which we will be entertained with a Q & A and stories from an eventful life both On and Off course of life on tour as PGA Professional. Tickets are priced at £40 per person. Tickets will go on sale as soon as the 1st Ball is struck in this years US Masters on Thursday 11th April. Food will be included in the price together with a Photo with the Legend himself.